- Joffre sends a lengthy communication to Grand Duke Nicholas at Russian army headquarters today, in which he emphasizes the important of co-ordinating offensive operations between the French and British in the west, the Russians in the east, and the Serbs in the Balkans. If simultaneous attacks can be launched, the Germans and Austro-Hungarians will be tied down on all fronts and the possibility increases of securing a substantial victory. The French Commander-in-Chief also seeks to reassure Grand Duke Nicholas, in the face of German redeployments from west to east since November, that the French army has done and is doing everything in its power to attack the Germans. - Enver Pasha is eager to see a land link opened between the Ottoman Empire and Austria-Hungary, which would allow the free flow of munitions and supplies and relieve many of the desparate shortages now existing in the Ottoman army. As the conquest of Serbia the means by which this link can be achieved, the Ottoman War Minister writes to Falkenhayn today to offer to place two Ottoman corps at the disposal of the Bulgarian army, should the latter join in an offensive against Serbia undertaken by Austria-Hungary and Germany. - Over the past week the men of the ANZAC Corps have been arriving on the island of Lemnos, having been assigned to participate in the amphibious operation against the Gallipoli peninsula, and today the ocean liner Minnewaska, carrying the divisional and corps command staff, moors in the immense anchorage at Mudros. 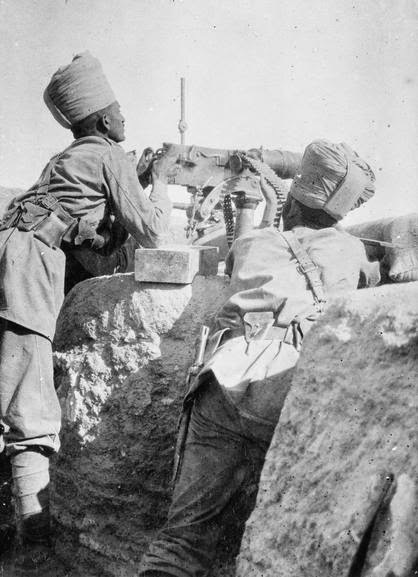 - In Lower Mesopotamia the now-expected Ottoman attack on the British defensive position at Shaiba opens this morning when a dozen Ottoman artillery pieces commence firing at dawn. From 9am through nightfall, the Ottoman infantry, aided by Arab irregulars, launch a series of attacks on the British line from the south, but are halted by barbed wire and machine-gun fire, and the British and Indians suffer only five dead and sixty-six wounded. To the east, the Indian 30th Brigade, is slogging through the ruins of Old Basra between Basra and Shaiba. With news arriving of the Ottoman attack, and an overland advance impossible given the knee-deep flood waters, General Nixon orders the brigade back to Basra. There they collect eighty boats, sufficient for brigade headquarters and the 24th Punjabis, and after 4pm begin moving up the river towards Shaiba. Though sailing under fire, they arrive at the British line between 830pm and midnight. 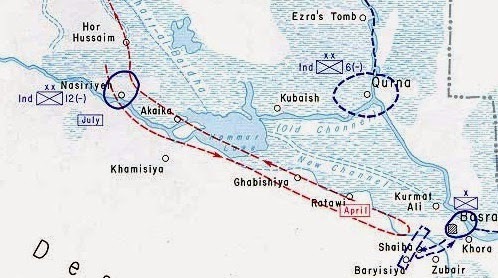 The British position at Shaiba, west of Basra, and the Ottoman advance and retreat, April 1915.
at Shaiba, April 12th, 1915.